December 3, 2010 - The National Transportation Safety Board will hold a public Board meeting on the crash of a U.S. Forest Service contract firefighting helicopter crash in Weaverville, California that happened on August 5, 2008. The hearing will be conducted on Tuesday, December 7, at 9:30 AM in its Board Room and Conference Center. A live and archived webcast of the proceedings will be available on the Board's website at www.ntsb.gov. A summary of the NTSB Board's final report, which will include findings, probable cause and safety recommendations, will appear on their website shortly after the conclusion of the meeting. The entire report will appear on their website several weeks later. On August 5, 2008, at 1941 Pacific daylight time, a Sikorsky, S-61N helicopter, N612AZ, experienced a loss of power to the main rotor during takeoff initial climb, and subsequently impacted trees and terrain near Weaverville, California. Post impact fire destroyed the helicopter. The airline transport pilot and 8 passengers were killed, and the commercial copilot and 3 passengers were seriously injured. The helicopter was being operated under contract to the United States Forest Service by Carson Helicopter Services, Inc., as a public-use flight. Visual meteorological conditions prevailed for the cross-country flight that was originating at the time of the accident. A company visual flight rules (VFR) flight plan had been filed. The helicopter was departing from Helispot 44 (H-44, elevation 5,935 feet) en route to Helispot 36 (H-36, elevation 2,516 feet) when the accident occurred. The helicopter had been assigned to transport approximately 50 wildland firefighter helitack crewmembers out of the Trinity Alps Wilderness of the Shasta Trinity National Forest due to forecasted worsening weather conditions. The helicopter had completed two trips, and had gone to Trinity Helibase to refuel. After it had refueled, it returned to H-44 for its third load of passengers. During departure, the helicopter impacted trees and subsequently terrain, coming to rest on its left side. 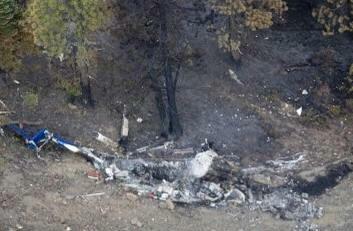 A postcrash fire consumed the aircraft.